Its been great fun trying new things out and seeing the end result. The students will put all of their experiments together into a binder that they can keep and use as reference. A book like this can be very useful. Here are some samples below. The final project will be a combination of techniques with one last new additive. It’s not a household additive, but something you have to buy at the store. It’s called by different names, Masking Fluid, Frisket, or even Masking Frisket, but they all work the same. I call it Frisket, because its fun to say. 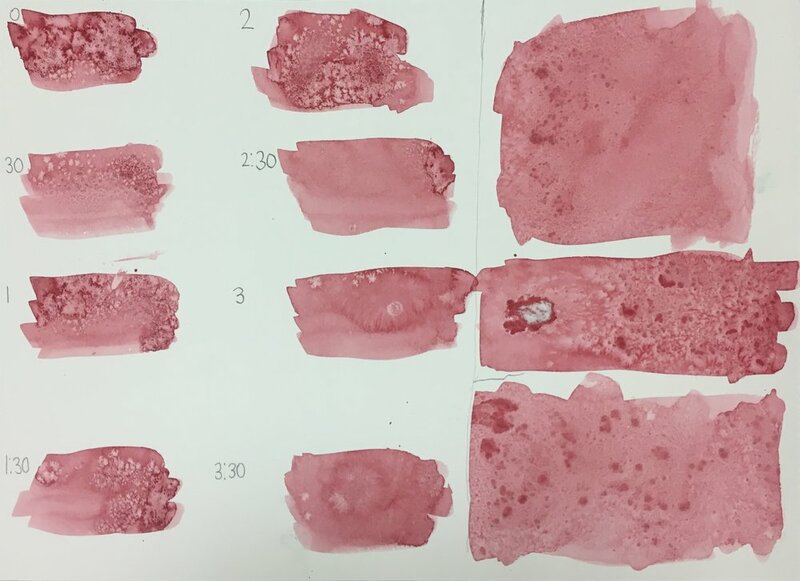 Frisket is a latex based liquid that can be painted onto watercolor paper and it creates a waterproof barrier, which keeps out all the water and color from soaking into the paper, creating some truly remarkable and versatile effects - seriously, we could do a whole course just on using Frisket. Each student will receive a vial of Frisket to take home and experiment. For the first few sessions, I felt that it would be worth while to have them review what they learned over the summer, to let it really sing it. They completed a quick landscape and then we moved on to the new content. The course culminated in two finished landscapes for each student, putting together all the techniques and experimentation. 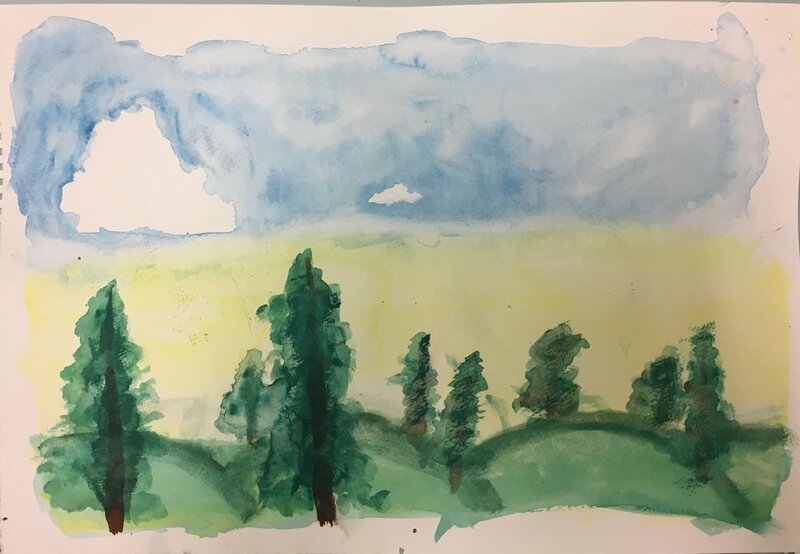 One of the overarching goals of the course was for them not to get locked into use watercolor the same way they would use other paints, like acrylic or oil. 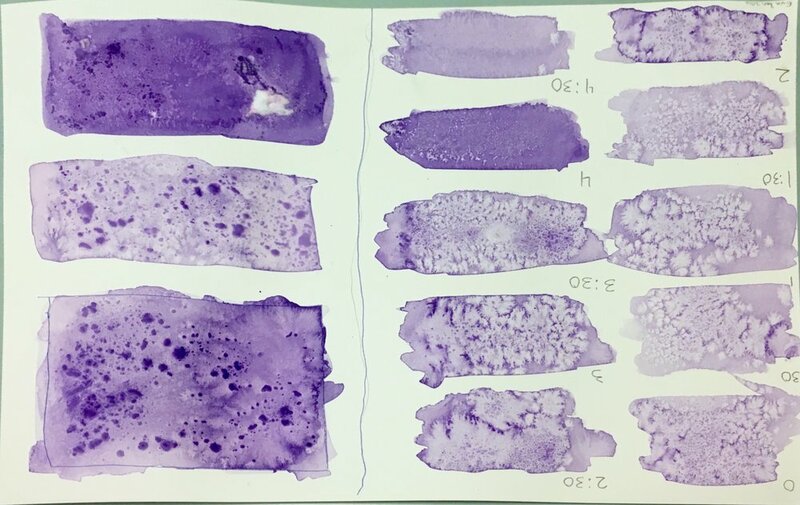 Watercolor has many unique attributes, and requires experimentation to get a handle on it. I am very pleased that they jumped right in with that mindset and were willing to accept, work with, and learn from their experimentation. With watercolor you have to think about process a lot. When to apply paint? How wet? How much paint? How many layers? For mountains and trees (and most things) there is a layering to build the desired look. 1) you first put down the dark green background leaves (let dry optional). 2) then the trunk and branches (let dry optional). With mountains, you build up starting with the lightest colors, and adding darker shades to build depth and texture. It's not really a sandwich, more like adding frosting to a cupcake. I can't think of a better analogy. This week we started the first aspect of creating a simple landscape: the sky. Clouds, to be specific. They started with experimenting and getting used to how watercolor behaves and how it dries. Then, we practiced a few application techniques and ideas to make desirable clouds (no outlined Mario clouds). They each did well for trying it for the first time. Discussion: Letting Watercolor be Watercolor. We talked about the philosophical side of watercolor. Didn’t know there was one? Watercolor is like life. We often have a natural tendency to control everything, but if we do, we will just become miserable and never become all we can be. If you have all freedom and no control, then you will only have a mess in the end. You have to have a balance. 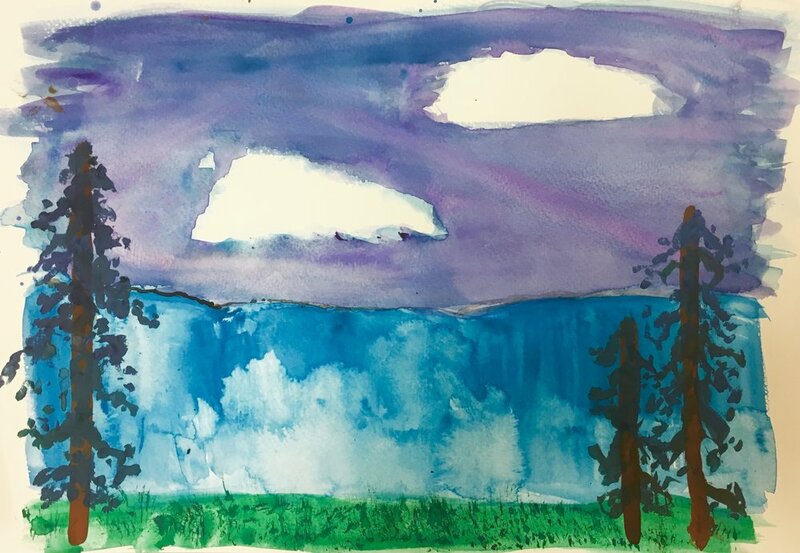 With watercolor, if you try to control everything, you can make a decent painting, but you miss out on all the beautiful qualities that watercolor has to offer. The students had to figure out on their own to get black ink to become several shades between black and white, using both wet on dry and wet on wet techniques. Ink is incredibly opaque and the darkness of the black will last quite a while. So they had to experiment to get it to do what they wanted it to do. If they can do it with ink, watercolor will be much easier. What they learned was that there are several ways to get it lighter or darker and that watercolor/ink is surprisingly very forgiving (as long as it doesn’t completely dry).